Have you ever had a day that was difficult yet rich and rewarding in many ways? I had such a day Tuesday March 15th, resulting ultimately in saving a life. The epitome of Living my Purpose, it was a perfect example of my Mission. You see, I was again called to help a Being who was living a very “should” existence “gone wrong”. Turns out she was in for a course-correction to more fully align with her Purpose, and I was blessed to be a part of that, which was, literally a life-saving opportunity. This Being was Adrienne, a 21-month old very sweet Holstein heifer. Adrienne was born into our dairy herd with the idea that she would become a milk producer herself – thus beginning her long list of “should’s”. 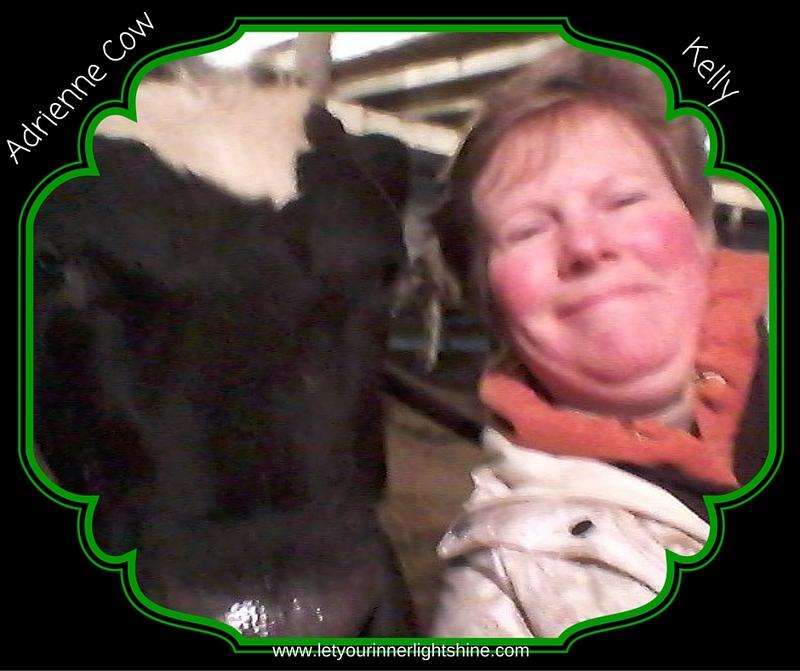 live a productive life as a dairy cow – her Mission to fulfill her Purpose. Because that is “what you should do” in this “family”. What did happen: she was injured in the barnyard while out with the herd for breeding. The exact nature of her pelvic injury could not be easily determined, and the vet recommended we give her time and see what happened. She showed NO signs of pain, and compensated wonderfully for her disability. I realized I was her best shot at having any quality of life, and I took a stand for her. That meant pushing myself to a new level. You see, my previous experience with our cows was that they aren’t receptive to affection and touch. They can quickly cause harm even with no such intention because of their size and power. Helping her successfully meant I had to push my caution limits. Trust. Faith. With an open heart, loving intentions, patience, and trust, I was able to treat her with craniosacral therapy and massage 5-7 days/week for almost a month. Her body released and self-corrected as much as possible. The swelling reduced. She was able to bear more weight on the injured side. Our mutual trust and respect grew. My husband said on more than one occasion, “You can’t do that with a heifer……” (as he watched me doing the “impossible”). She guided the session, as is true with my human clients. Despite all of that, her physical disability persisted significantly, leaving her unable to produce a calf with a favorable outcome for either one of them. And, we learned 4 months after her injury that she was, in fact, 4 months pregnant. She could not safely continue to live at our place with any quality of life. She could not “do the job she should do” – be a dairy producer. No calf = no milk = no job. What could we do? Any treatment was beyond our financial means. Our choices were limited, including ending her life. I couldn’t do that, though. I felt that, with the right help (more than we could afford to give her), she could live a good life in the right place. Her Soul was whispering for a course-correction that had been going unheard. A course-correction that would better align her with her TRUE Purpose, her TRUE Mission, vs. the “should’s” that she had been living. The “shoulds” as we believed them to be. She was hearing those whispers, and thru her injury, and our connection, was communicating them to me. My heart compelled me to reach out to my friend Susan Hamlin, The Saratoga Animal Whisperer , for support. Susan suggested placement in a sanctuary. We started with Spring Farm CARES, who referred us to Farm Sanctuary in Watkins Glen, NY. Monday 3/14/16 at about 5:15 pm I first spoke with Farm Sanctuary. At 8:30 pm they emailed me that they would take her, and wanted to arrange for pick up as soon as possible. Farm Sanctuary picked her up at 1:30 pm that day. I knew I was doing the “right thing”, because of the deep connection I have to my Inner Wisdom, yet my human side still worried about her. The transport team was super. They were incredibly compassionate, and sensitive to my feelings. They took every effort to make her comfortable, with thick bed of straw in the entire 24-foot trailer, and a bale of their best hay for munching during her trip. She loaded fairly easily. She balked once, and my husband stopped. I put my hands on her, and gently told her it was ok, that she was going for the help she needed and the life she deserved. She was like a hound dog once inside the trailer, sniffing and exploring. I knew she was ok so far. She was taken to Cornell University Veterinary Hospital for admission, evaluation, and treatment. For those who don’t know, that is the “go to” place here for involved cases, and when service beyond the ability of the local veterinarians is in order. I have been told that one of their team members is tops in the country for this situation. Adrienne has had some X-rays which were inconclusive because of her size and the fact that she was standing. She will have more while on the table under anesthesia. She has aborted her calf, which, unfortunately, is best for all. Now, we wait. After evaluation and treatment, she will go to live at her new forever home at Farm Sanctuary. I will visit. I share this with you because so often we get tied to what or how we think things “should” be. And, when we don’t open our hearts to the whispers of our Soul to look past those “shoulds”, to our TRUTH, the whispers get louder. The language changes to something we can hear…. often the loud shouts of trauma, crises, disruption. Typically we then lament, mask the pain and go back to the same ways, vs. listening to the deeper message and responding accordingly. There is light at the end of your “shoulds”, if you look down the tunnel for it. Open not just your eyes, but your heart to light the way in Trust and Faith. I would have loved to see her body completely self-correct, and be “normal”. If that had happened, she would have continued as a dairy cow. But I know that she has a different Mission, which would not have happened if things went as they “should have”. Adrienne’s life is meant to be lived in other ways so that she can serve her Purpose. In “doing” my Mission (using my gifts and talents with craniosacral and massage therapy, following my Inner Wisdom) I was able to assist her in living her Purpose. It isn’t for me to know what that is, but to do my part in the journey. I must remain detached from what I may think “should be”. And, my Mission is evolving as a result. My next steps are slowly being built and revealed. My life is forever changed. My nest is a little emptier. Because this sweet Being, in living her Purpose, as influenced how I live mine. It isn’t always easy. I am still human. I sobbed this week as I haven’t in while. Despair, frustration, grief, relief, hope, gratitude, and joy. Priceless. Adrienne’s Purpose is still revealing itself, and it is still being served. Being a dairy cow was the Mission she “should” have had. Her TRUE Mission is being revealed as she more fully lives in alignment with her Purpose. Who knows how many more lives she will touch? She is HOME now, in her life. Are you? Your Purpose is what you HAVE and your Vision is what will BE as a result of DOING your Mission. My Purpose is to use my gifts and talents freely to transform the world, and my Soul’s Intentions for this lifetime are fulfilled. It is my destiny and my birthright. My Mission is what I DO to accomplish that. My Vision is what will BE when that all falls into place. What are your Vision, Mission, and Purpose? If you aren’t sure, start here: http://goo.gl/2gWAbX. Or, contact me today to see how you can begin spending your next chapter living On-Purpose. Feel free to share, and comment below! It’s amazing what we can learn from our experiences. And so valuable when we take the time to think about how those experiences can help others. Thanks for sharing Kelly! Yes, Cindy, it is amazing. Especially when you are paying attention to all of those pearls of wisdom within! And, yes, “value added” when you can use those, or share them, to help others. Thank you for taking the time to chime in here! Have an awesome day!